Our personalised sashes are available for all sorts of occasions. Golden Finishes produce a huge range of promotional sashes for ceremonial events from pageants to hen parties – our wide range means we have something for every budget! Our sashes come in a wide range of colours, including baby pink, black, bottle green, bronze, emerald green, fuchsia, gold, navy, red, royal, silver, white and yellow. All sashes can be personalised according to your requirements – our personalised sashes are perfect for special occasions, so get in touch now to discuss your dream sash with a member of the Golden Finishes team! Whatever type of sash you need, we can sort it! Our printed sashes are very popular, with our hen night sashes and birthday sashes being the most popular options (although we also supply sashes for beauty queen pageants and promotional events). If you would like your personalised sash to be screen printed then there is a limitation of two colours, but this will be more than enough to grab everyone’s attention. Whether you want text, an image, or both, we will deliver your high-quality sashes right to your front door. Blank sashes are also available as part of our Ready Range. All of our sashes are available unbranded in a range of colours and sizes to suit all purposes. For more information, please visit www.ready-range.co.uk. Can I wash and iron my sash? Our high-quality sashes are made of manmade fibres and are not really suitable for washing. They are an inexpensive product that is intended to have a relatively short life. However, sashes made from heavier materials can be cleaned and would last more than one event. 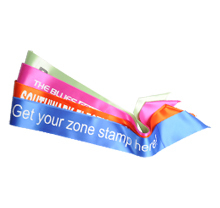 This is ideal for personalised sashes and promotional sashes. One tip for storing the ribbon sashes is to store them as flat as possible with NO folds! The colour I want is not shown – can you help? We have a wide range of colours to suit every purpose. Our customisable sashes can be personalised with practically any colour you like. Speak to our Customer Service Team who will try and match the colour of ribbon you are looking for. I need sashes for children! Do you offer smaller sizes? 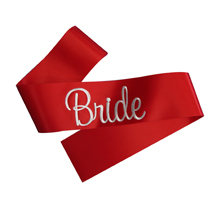 OOur ribbon sashes are one-size-fits-all. However, if your sash requirements demand a smaller size, please speak to our Customer Service Team and they will arrange for a reduced size to be made. Can I have something printed on the back of my sash? The print area for the front and back of a sash is 650mm x 80mm (25 inches x 3 inches). Speak to our Customer Service Team to discuss your requirements. For more information on how we can help with your sash requirements, please call 02920 755733 or email info@goldenfinishes.com.